The impetus for this project grew out of a new reality unfolding in the USSR. The euphoria over Israel’s stunning victory in the 1967 Six Day War emboldened a number of Soviet Jews to publicly petition their government for permission to leave for Israel. Many also sent appeals for support to the U.N. General Assembly and other international bodies. Audaciously, each person had signed an appeal with his or her name and address. By early 1970, we had assembled names and addresses of 72 petitioners. My idea was to make available to ordinary Americans a special holiday greeting card for mailing to one or more of the 72 petitioners, as a gesture of support. I checked on the merits of the project with U.S. Sovietologists and was encouraged to proceed. My next move was to discuss a Passover card project with the JCFC. I met with Sid Vincent and Ed Rosenthal, laid out the project and the results of my research and got a thumbs-up to the JCFC partnering with us on the project. Next was the matter of the cards. Ed arranged for a luncheon meeting with Irving Stone, a Federation trustee and chairman of the American Greeting Card Company. I described the project to Irving over the salad and by the main course he was on board. He offered to have his calligrapher lay out our text message, provide the art work for the face of the card, do the printing and folding and only charge us for his outside costs — paper and envelopes. Ed and I came up with a Russian and Yiddish text that read “Happy Passover …The Jews of the USA to the Jews of the USSR: We have not forgotten you.” Lastly, there was the packaging: five cards and envelopes in a clear plastic pouch, together with mailing instructions and five names and addresses of Soviet Jews from our list of 72 names. 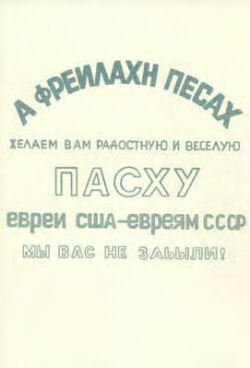 In the weeks before Passover, the CCSA, the Federation, and grass roots Soviet Jewry groups elsewhere sold a total of about 10,000 cards. A month later, we began hearing from people who had purchased greeting cards. Bingo! They were delighted and thrilled. They had received a response from a Soviet Jew to whom they had mailed a card. For them, Soviet Jewry was no longer an abstraction. It was personal and immediate — embodied in the individual or family who replied to their card. What an eye-opener! This one-to-one approach offered a powerful way to engage Americans in the Soviet Jewry issue. It suggested a whole range of new opportunities, several of which we subsequently developed into discrete people-to-people projects. Together, these projects were a major factor in transforming Soviet Jewry from a cause into a mass movement. That summer, 13 of the Soviet Jewish families on our mailing list received exit visas for Israel. We repeated the project in the fall for Rosh Hashanah; again with specially prepared cards from the American Greeting Card Company. The list of Soviet addressees, this time, was 196. Approximately 45,000 cards were purchased and the responses from Soviet Jews were comparably greater. 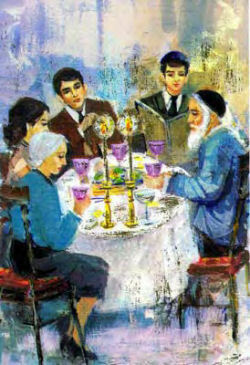 The card project — Passover and Rosh Hashanah — continued as a national project of the Union of Councils for Soviet Jews (see below) for several years with great success.